A prolific author and founding member of the Royal Society, John Evelyn (1620-1706) was one of the most remarkable intellectuals in late seventeenth-century English society. While his diary has long been considered second only to that of Samuel Pepys in importance, until quite recently his papers were inaccessible to scholars. 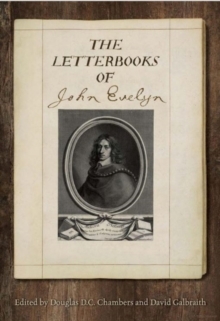 The Letterbooks of John Evelyn, a 2-volume collection of more than eight hundred letters selected by Evelyn himself, constitutes an essential new resource for scholars of seventeenth-century England. The two books in this set give modern readers access to Evelyn's correspondence with scientists and scholars such as Robert Boyle and Richard Bentley, political figures including Edward Hyde and Sidney Godolphin, and his friend and fellow diarist Samuel Pepys. They also include Evelyn's accounts of major events such as the restoration of the monarchy in 1660, the "Glorious Revolution" of 1688, and the founding and early history of the Royal Society.